In this article we’re going to look at more applications of the “lower x-block” from reverse-cat-stance (Figure 1) . 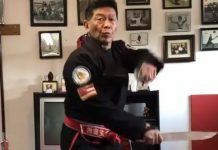 In Part 1 of this series we established that the modern labels commonly attributed to kata movements have nothing to do with the intended function of that movement. Just because a movement is now labelled as a “block”, does not mean it was originally intended to be applied as a block. In the last article we saw how “lower x-block” could be applied as a strangle, and how assuming reverse-cat-stance would increase the effect of that strangle. 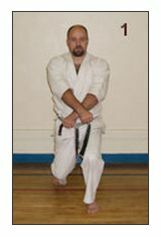 The stances in kata are “snapshots” that show how the bodyweight should be distributed and shifted. I feel that “stance” is sometimes a misleading word because it has connotations of something fixed and immobile. In reality, stances are simply the weight distribution and leg position required at a given instant. There is nothing fixed; the bodyweight shifts through the “stances” as needed. In addition to the shift in bodyweight, the actual position of the legs of a stance can be used to control the opponent’s motion and hence enhance the effect of the technique. The strangle we showed in Part 3 made used of the weight shift caused by assuming reverse-cat-stance. The joint locking applications of “lower x-block” that we will be examining in this article will make use of the leg position of reverse-cat-stance to control the opponent’s motion. It is hoped that these examples will help those new to bunkai study to understand the key ways in which stances are to be realistically used. Trap the opponent’s arm and deliver a palm heel strike (Figure 2). Maintain a tight grip on the opponent’s wrist and slam your forearm down onto the inside of their elbow joint. This will cause the opponent’s elbow to bend and can break their balance. Continue the motion so that you can lock your slamming arm onto the top of your grabbing arm. Shift forward slightly as you tie up the arm so that the opponent’s elbow is against your chest (Figure 3). 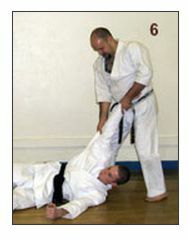 Twist to the side whilst pushing down on the opponent’s wrist in order to lock their shoulder and completely break their balance (Figure 4). The instant the opponent hits the floor, drop your knee onto their ribs and pull upwards. This will injure the opponent’s rib cage and take out the wrist (Figure 5). The leg and arm positions at this point are “lower x-block” and reverse-cat-stance. The assuming of reverse-cat-stance makes use of the bodyweight during the takedown. The knee hitting the ribs will also prevent the opponent from rising as the wrist lock is applied and therefore the lock will have a far greater effect. We can see how the position of the knee is controlling the opponent. During bunkai training it is very important that the function of the stance is always considered and utilised. Reverse-cat-stance can also be used to prevent the opponent from rotating on the floor. A great example of this is found in Pinan Godan / Heian Godan kata. The sequence we are looking at is the one that ends with jump. The kata breaks the opponent’s grip on your arms, traps their arms, delivers a strike, and then throws the opponent. Now that the opponent is on the floor, the kata shows how you can follow them onto floor and dislocate their shoulder. The final application of the jump into “lower x-block” from reverse-cat-stance is the technique we’ll be examining in this article. The opponent has been thrown to the floor by the preceding moves (Figure 6). 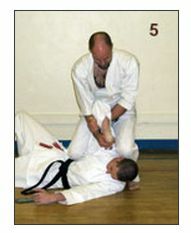 Drop down whilst placing your arm between the opponent’s head and arm. Sharply bring your forearm upwards to bend the opponent’s arm (Figure 7). In order to stop the opponent from pulling their arm away, seize the back of your opponent’s arm. Secure the hand on the opponent’s arm by grabbing your wrist with your other arm (Figure 8). If you were to twist the opponent’s arm at this point, they would simply turn around and alleviate the pressure on their shoulder. If, however, you throw your leg on to the other side of the opponent (the purpose of the jump) the opponent can’t turn out of the lock and hence it will be much more effective. The leg position at this point is again reverse-cat-stance (Figure 9). 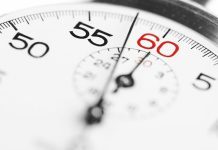 In Part 4 we’ve seen a few more examples of how the techniques that are nowadays mislabelled as “blocks” can be pragmatically used when correctly understood. We’ve also seen more instances of how the stances are used to make techniques as effective as possible. 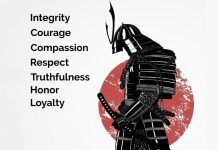 The techniques we’ve looked at in this and the preceding article also introduce another fundamental concept of bunkai: the concept of Multiple Function. In these articles we have seen three differing ways in which “x-block” from reverse-cat-stance can be applied: as a strangle (in Part 3), as a wrist-lock takedown, and as a shoulder-lock. The exact function of any given “x-block” is determined by the kata in question and the surrounding techniques i.e. the “x-block” we’ve just looked at from Godan can’t be the standing strangle shown in Part 3 as the preceding throw means the opponent is not standing. It is a pretty safe assumption that in the past the intention of any movement would be more apparent due to the exact way in which the motion was performed. However, as kata was being taught without application to large groups, movements were simplified, became more uniform and some specific details were lost. This is not a great problem as long as we understand the nature of kata and the various methods of application. 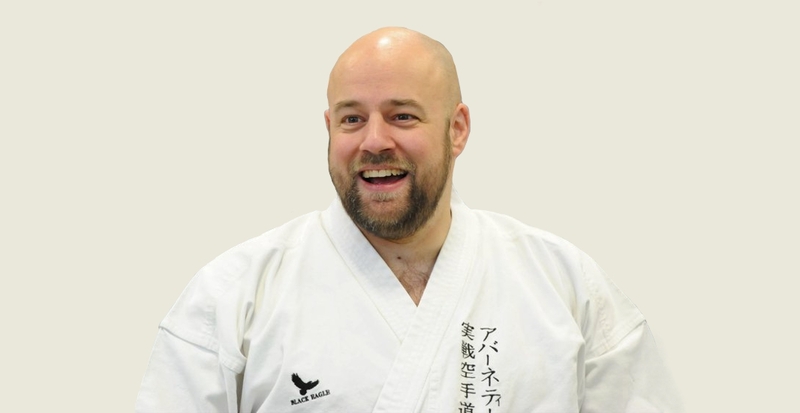 A key part of bunkai study is to understand that although various kata movements may look alike, they don’t automatically always have the same application i.e. not all “x-blocks” are to be applied as ground-fighting shoulder locks. Another key to understanding kata is that they do include generic motions with multiple functions. Sometimes a movement is only meant to be applied in one way; other times it has a few equally valid uses. It is therefore important to understand that some kata movements may have been included with more than one specific function in mind. In 1908 Anko Itosu (creator of the Pinan / Heian series of kata) documented his ten key principles of karate. His sixth principle stated, “There are many movements in karate. In training, you must try to understand the application of all movements. You must take into account all possible applications. Kata movements can have many applications”. There are therefore two key issues to understand when talking about multiple function. Firstly, it is very important that those new to bunkai study don’t fall into the trap of thinking that any given movement is applied in the exact same way in every kata (look at the surrounding movements to gain a clear understanding). Secondly, another mistake that those new to bunkai study can make is to think that all kata sequences only have a single use. Some do only have a single function; however, some have more than one use. We need to follow Itosu’s advice and be sure to fully explore our kata. The trick to avoiding both errors is to always examine a movement in the context it is presented in the kata, and to then explore all the possibilities of that context. We’ll return to these ideas in future articles. In Part 5, we’ll examine another common kata motion; that of “lower-block”. We’ll see how the motion can be applied as an arm-bar and a combination takedown. 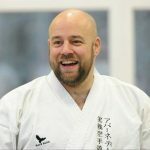 We’ll also look at a few more basic bunkai concepts that will help you to better understand kata and make use of the information they were created to record.